Are you looking for paper quilling ideas? Perhaps you know how to make the basic shapes but need ideas for what to make with them? Well you are in the right place. This site will introduce new techniques and show you how you can use those techniques in your quilled projects. 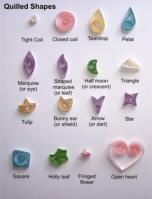 You will find an index of free quilling patterns for all occasions to make it easy to find what you are looking for. There is even somewhere to share your own ideas and chat with others about theirs. Flowers are perhaps one of the most popular paper quilling ideas and they are fantastic for decorating frames, cards and invitations. You can use various quilled shapes to build up your flower. Each shape can represent a petal or you can glue a number of shapes together to create larger petals. Tight coils make great flower centres. Snipping one edge of your paper strip and then rolling a tight coil can make attractive fringed flowers. Folding as well as rolling the paper can create effective paper roses. But all quilling does not have to be floral, don't forget the rest of the natural world. You can get many paper quilling ideas from the creatures that share our planet: from elaborate peacocks with their amazing tails to simple-to-make ducklings. Making a quilled animal needn't be complicated, just three shapes and a strip of paper were enough to create the tiny harvest mouse in the photograph, left. 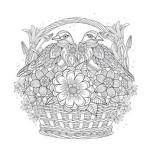 If you have something larger in mind, why not find a picture you like, perhaps in a colouring book, and fill the outline with quilled shapes in appropriate colours? It is possible to create extremely realistic looking animals in this manner. If you cannot find paper strips in the colours you need you could even paint your own paper and cut it yourself. 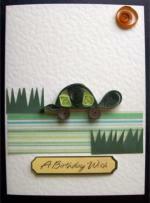 Animals and birds such as bunnies and chicks are perfect for your Easter paper quilling ideas. Or you could include penguins or robins on your Christmas cards. You could even incorporate both flora and fauna in one project by adding a tiny butterfly or bee to a picture of summer flowers. 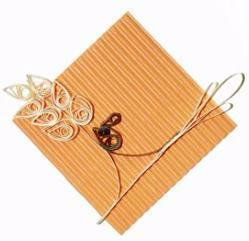 Quilling is a hobby that children can take part in themselves. Using slightly wider paper, for ease of handling, their creativity knows no bounds and I am constantly surprised with the paper quilling ideas that they come up with. If you wish to make quilled birthday cards for children there are so many things you could include. Starting with something really simple, how about some colourful balloons? A simple coil with a small triangle at the bottom and a strip of paper for the string and you have your first balloon. You could even make a little creature to hold the end of the string. Don't forget the boys! I have seen quilling kits containing things like JCB's and dinosaurs especially for the lads. Although younger babies are too young to enjoy quilling, new parents may love to receive quilled baby cards to celebrate the new addition to their family. The birth of a baby isn't the only special ocassion that can be celebrated with quilling. 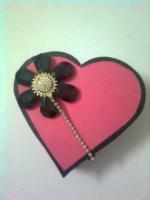 Quilling is ideal for romantic valentine's day cards. Say "I love you" with quilled flowers, hearts and bows. And for those who have tied the knot, you can add wedding rings, doves and bells to create a one-of-a-kind wedding card. You can even quill a tiny wedding dress for the bride or a suit for the bridegroom. In fact you could create mini 3D figures of the happy couple to stand atop the wedding cake. Or how about making flowers to match the brides bouquet and to decorate the ribbon that goes around the cake? I have also seen card boxes made in the shape of a slice of wedding cake, decorated with quilled flowers that are ideal for the guests to take home with them, with or without a slice of cake inside. The Christmas holidays are just made for quilling! After decorating your cards and gift tags with Christmas trees, wreaths, angels, stockings, presents, candles and poinsettias you turn your mind to decorating the home. Quilled Christmas ornaments can be hung on the tree, 3d decorations can be made for the mantlepiece and snowflakes hung in the windows. Don't forget Santa himself, his reindeers and elves when making your cards. Of course a quilling kit itself makes a grand Christmas present for anyone (even yourself)! Don't blame me if you get addicted though! An introduction to this ancient craft of quilling or paper filigree. What do you need for quilling? The place to start to learn how to quill. Quilled flowers are always popular. Make quilled Christmas cards this year! A free simple quilling pattern for you. Try this simple card for a new baby.